Poster detail for <em>Transformers: Age of Extinction</em>. Hollywood made news this summer with the China triumph of Transformers: Age of Extinction, which broke all previous Chinese box office records. The Chinese box office even outsold the North American box office. But jubilation over the film’s monetary success has been dampened somewhat by jeers from major news outlets in the West that Transformers 4 was yet another example of Hollywood’s selling out to China. Critics of the film point to its numerous Chinese product placements, generously featured Chinese landmarks, cameos by Chinese pop stars, as well as what is perceived to be a pro-Chinese-government message. To find out how low Hollywood had sunk this time, I braved the midtown Manhattan crowds, and ventured out to AMC Empire-25, a branch of the now-Chinese-owned theater chain, to catch a show. After 165 minutes of relentless explosions, I come away in awe of Hollywood’s ability to transform a piece of trash into a golden goose. And I find the moaning over Hollywood’s capitulation to China completely unwarranted. On the contrary, Transformers 4 is a Hollywood tentpole film that effectively delivers a playfully cheerful image of the U.S. to China. Hollywood scores first for Transformers 4’s audacious self-mockery. When director Michael Bay, whose name many Chinese micro-bloggers translate as Mai Kaobei (卖拷贝), or “Selling Copies,” introduces us early in the film to the owner of a dilapidated theater, the old man complains that “movies nowadays” are “a bunch of crap” with “sequels and remakes.” The self-referential dig sets the post-modern tone for the film and the Transformers franchise, if not Hollywood’s entire tentpole enterprise. Adding further mockery, a junk truck Mark Wahlberg’s character has bought cheaply from the old man turns out to be Optimus Prime, the film’s robot hero. That one man’s trash can become another man’s treasure is the secret behind Selling Copies’ masterpiece, which lured millions of Chinese viewers to the theater. A record number of Chinese being held captive to Hollywood’s “spectacular junk” (as the Telegraph put it) is the ultimate victory for U.S. popular culture. Poster for <em>Transformers: Age of Extinction</em>. Hollywood scores more points by reserving space for the Chinese partners to tag along for the joy ride at China’s own cost. The Chinese paid to have their products and landmarks shown and China contributed cameos by its beloved pop stars, which are so haphazardly strung together that they are, at worst, insults and at best satire, none of which cast China in a particularly glowing light. American characters’ drinking the Chinese version of Red Bull and using a Chinese ATM card in Texas, or taking a moment to sip Chinese milk on a Hong Kong rooftop with a deadly assassin in hot pursuit hardly do justice to the plot or even to the products themselves. A Chinese survey conducted by Sina indicated that the product placements in the movie had little impact on Chinese consumer behavior. I see no evidence of U.S. imports of Chinese soft drinks and milk in the near future. And the assorted Chinese celebrities, from Zou Shiming, China’s first Olympic gold medalist boxer, to Li Bingbing, China’s female screen icon, are so perfunctorily inserted into the film that they amount to nothing more than another type of incoherent product placement. Chinese viewers find these instances of “special China delivery” patronizing. Plus, it is Chinese film that suffers when Hollywood dumps the likes of Transformers 4 on the Chinese market. It is thanks to the brilliant production assistance and marketing campaign of Selling Copies’ willing Chinese partners, the monopolistic China Film Group (CFG) and its sister company, the equally monopolistic China Central Television movie channel, that Paramount was able to conquer China’s massive market, at the expense of China’s smaller private film companies. 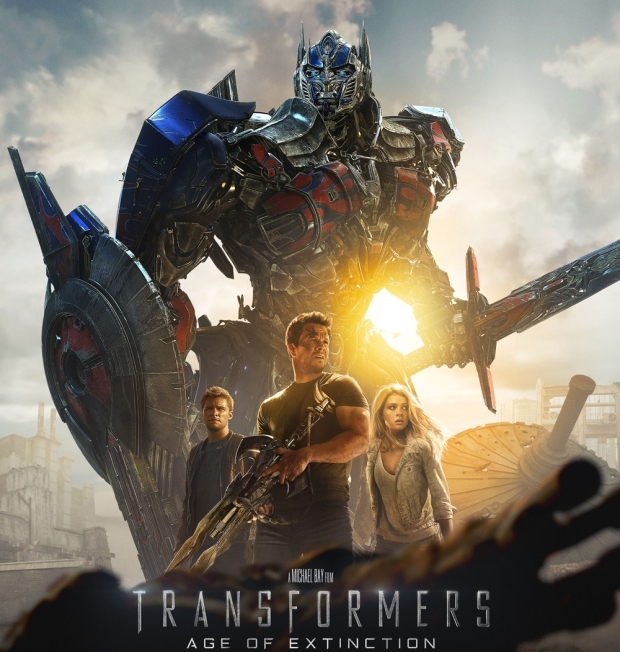 Zhang Hongsen, Chief of the film bureau of the Chinese State Administration of Press, Publication, Radio, Film, and Television, saw it coming when he urged cinema owners to ensure that local movies would not be squeezed out by Transformers 4. Perhaps, in addition to investigating U.S. firms for anti-trust violations, the Chinese state should look into CFG’s monopolistic practices in China. Now let’s look at the film’s narrative, if there is such a thing in the Transformers franchise. The film takes a predictable jab at the CIA while depicting a timid White House as beholden to the interests of both the military industrial complex and vapid high-tech evangelicals. It juxtaposes the ineffectual U.S. government with a Chinese state led by an upright-looking Chinese defense minister who is determined to save Hong Kong from an alien robot attack. This set-up has many Western commentators worried that the Chinese Communist Party comes across as the good guy. The Guardian called such a decision “sinister,” as it showcased an autocratic political system as more functional and humane than Western democracy. The Financial Times lamented that, “While western democracy is represented by a Cheney-esque goon heading up the CIA and running rings around an ineffectual president, the response of the Chinese government to alien invasion is one of efficient, disciplined resolve.” Well, if you watch carefully, the film’s fictional Chinese defense minister apparently has an office located in Pangu Plaza, the dragon-shaped hotel, office, and mall complex, of one of the film’s Chinese sponsors. Plus while Selling Copies’ Chinese collaborator, according to numerous Chinese reports, insisted on adding a Chinese military presence in the film, the determined defense minister is accorded only a brief shot as he vows to scramble China’s fighter jets to defend Hong Kong. No Chinese fighter jets appear in the film and no Chinese government action is shown. Instead, it is up to a few Americans from Texas to come and run around the Far East to save the human race. The film perpetuates the myth of triumphant American individualism and exceptionalism. The supposedly worrisome contrast between the dysfunctional U.S. government and the highly disciplined Chinese government actually highlights the very deficiency of a media under the tight grip of a Chinese state that insists it must be depicted in a positive light. Variety gets it wrong when it declares that “Transformers: Age of Extinction is a very patriotic film” but that “it’s just Chinese patriotism on the screen, not American.” By portraying a renegade Texan who comes to the rescue of China and the world, Transformers 4 actually winds up celebrating America more than it does China. The Chinese on the screen, including the upright defense minister, are reduced to sidekicks and bystanders. A.O. Scott in The New York Times has it right that the “[Transformers] franchise seems like the most baldly and cynically commercial calculation imaginable — it is merchandising-based entertainment at its purest.” Little does he know that Big Shot’s Funeral, popular director Feng Xiaogang’s 2001 offering, demonstrated equally imaginative commercial calculation when it deftly spoofed its own merchandising-based production. The film actually featured Hollywood personalities: Donald Southerland as a main character and Paul Mazursky in a generous cameo. But it received little notice beyond China as the U.S. market has little room for non-Hollywood products. It might indeed be the case that Hollywood tentpoles increasingly are catering to Chinese tastes, yet Chinese taste long has been molded by Hollywood, which ultimately sells American, not Chinese, dreams. Joseph Stalin once remarked: “If I could control the medium of the American motion picture, I would need nothing else to convert the entire world to Communism.” Comrade Stalin, you’re going to have to keep waiting. Let’s give Hollywood the praise it deserves: true, for this author, going to see Hollywood tentpole films may feel ever more like an occupational hazard, but in the fight for soft power Transformers 4 has scored big for the U.S.